SPRING LAKE – Hailey Hrynewich of Muskegon and Allyson Geer and Emmie Pietila of Brighton shared the lead through the first round of stroke play qualifying in the 99th Michigan Women’s Amateur Championship presented by the West Michigan Golf Show at Spring Lake Country Club. Hrynewich, an Ohio University golfer and the low amateur in the Michigan Women’s Open earlier this summer, Geer, last year’s qualifying medalist at age 15 and a quarterfinalist, and Pietila, the 2012 Michigan Amateur champion and University of Tennessee golfer opened with 2-under rounds of 70 Monday. They top the field of 80 that will play 18 more holes of stroke play today to determine a qualifying medalist and the low 32 golfers for the match play bracket. Match play starts Wednesday and continues through Friday to determine a state champion. Grand Valley State golfer Gabrielle Shipley of Hastings shot 71, and Hannah Pietila, Emmie’s sister and teammate at Tennessee, and Gabrielle Yurik, a Michigan State University golfer from Oakland, each shot 72. Hometown favorite Anna Kramer, whose parents are Spring Lake members, and Tenley Shield of Grosse Pointe Park and Princeton University each shot 73, and Cordelia Chan of Birmingham and Saline nurse Sarah Hoffman shot 74. 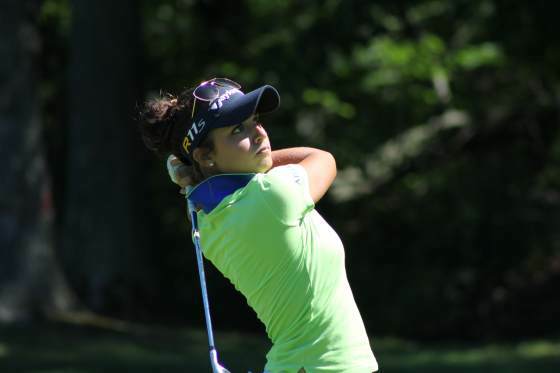 Hrynewich, who will be a junior this fall at Ohio University, said being low amateur earlier this summer in the Michigan Women’s Open has given her confidence this summer and it is showing in her play. She wants to take a run at being qualifying medalist as well as champion at the end of the week. She had just one bogey and three birdies, starting with a sand-shot birdie on No. 1 and closing with an 8-iron to four-feet for birdie on 18. Pietila, who opened the Michigan Women’s Open earlier this summer with a 64 at Crystal Mountain and led for two rounds, said was pleased with her round overall, but not the finish where she bogeyed two of the final three holes. “Hit a bad shot on 16 and paid for it, didn’t take advantage of the par 5 and made a 5 and then hit it in the trees on 18,” she said. “But there were positives to take away before that. I had a good round going and I was hitting it well and putting it well. Pietila said she will not really think about the medalist chase, and keep working toward winning a second state championship. Geer, who is home-schooled and an AJGA All-American, said a second straight medalist trophy would be nice, but her eyes are on the bigger prize of winning the championship. “That’s the goal,” she said. Geer, who at age 14 committed to Michigan State for college golf, said she made five birdies against three bogeys in her round, and that included two tap-in two-inch birdie putts off iron shot approaches. Complete results, more information and a photo gallery can be found at www.gam.org.